Pado Saskatoon! Plato asked a spoon! Task the room with matching runes. Flasks of booze! Glass spittoon! Alas, the fastest path is doom. Raspy crones in fashion swoon. Masked the moon with flashy tunes. Amassed a boon and dashed it by noon. 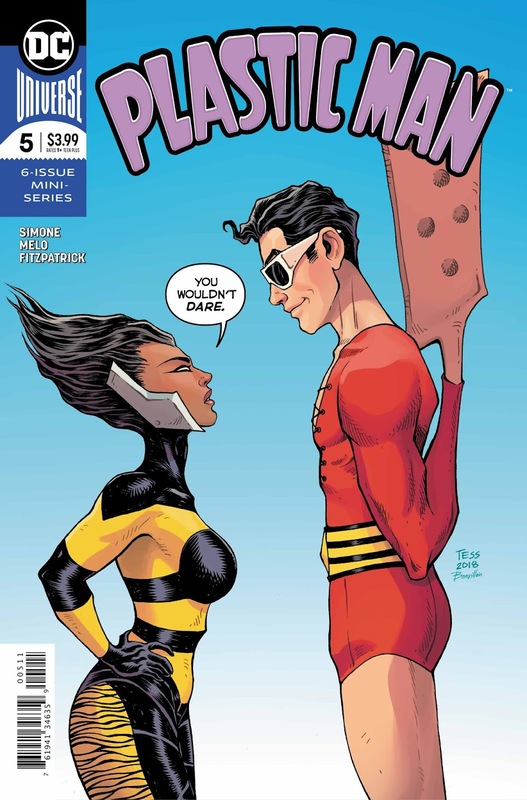 At last, or soon, my review of Plastic Man #5, kaboom! When I was around eleven years old, I came home very late from school. My grandmother was waiting for me and asked where I’d been. I don’t remember what I was really doing that day, maybe hanging out longer than normal at the candy store to play video games (or watch others play video games,) or maybe I went to somebody’s house for a little while—whatever it was that I really did, I lied and told my grandma that I’d been mugged. She was concerned and I kind of shrugged it off, since it didn’t actually happen, and went to my room to read MAD magazine or whatever. And then, a week later, I actually did get mugged. They got fifty cents and a really cheap gold chain my church had given to me (I was eleven, after all.) That time, I felt humiliated and violated, and walked home from school crying, but when I got home I couldn’t rightly say I’d been mugged twice in two weeks, so I had to swallow my feelings and act like everything was fine. 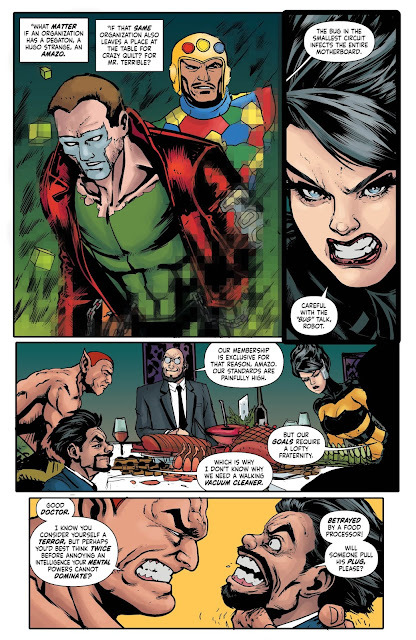 That’s kind of what’s happened in Plastic Man: Obscura put forth a fake Cabal in order to manipulate Plas’ emotions into battling a real cabal consisting of various leftover DC Comics villains. And uh, this might be the worst plan ever conceived. They wouldn’t even come up with something this hackneyed on Three’s Company. But you know, it’s not a bad plot to a comic book story arc. 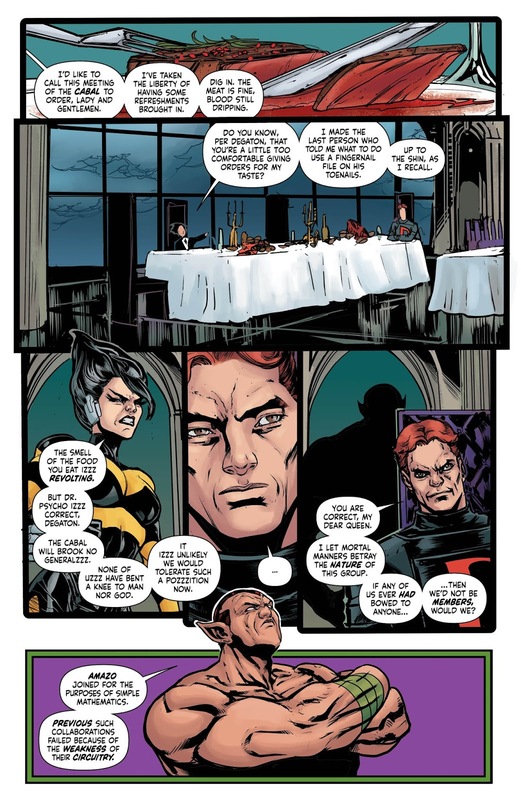 The problem is, it’s like one of five things happening concurrently in the same six issues. I know I’m normally beating the drum for arcs shorter than six issues, but here’s a case where we might have done better with a few more issues—or perhaps these stories could have been arranged differently within one six-issue arc, because I am having trouble with A) juggling these different yarns, and B) caring about all of them equally. The parent/child relationship that’s supposed to be developing between Plas and Pado Saskatoon doesn’t really read. 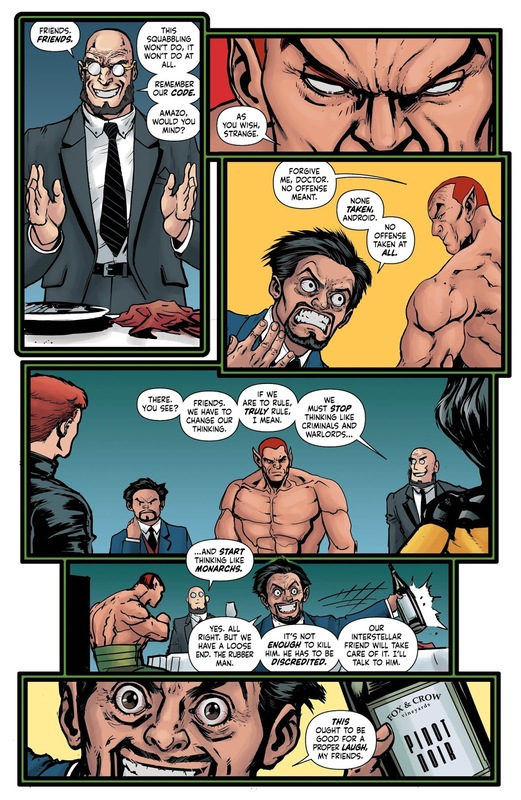 Plas spends the first part of the issue trying to dump the kid on Man-Bat, then later goes to the carnival with Pado and one of the strippers. Where Pado gets taken away by Child Protective Services, who Plastic Man had called earlier in the series. It looks like a heart-wrenching, tearful scene, but since O’Brien was trying to dump the kid off a few pages earlier, I’m not feeling the drama. 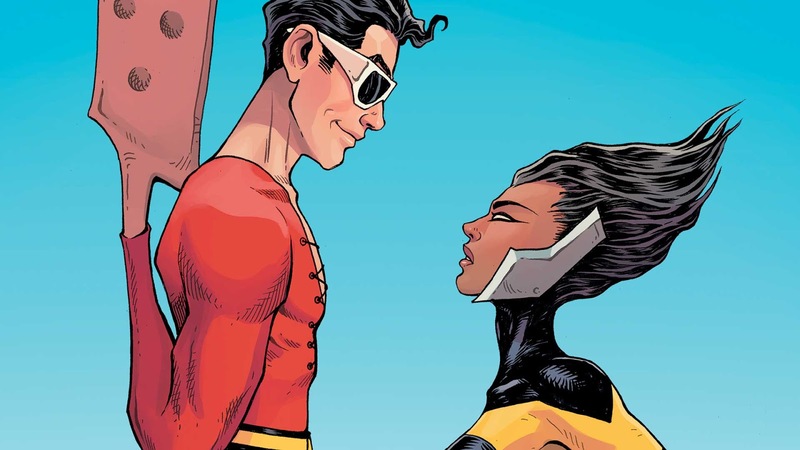 Then there’s the fake Plastic Man that kills people and scrawls JLA next to them. Turns out this is a hired Durlan. I don’t know what to make of this plot, I feel like there are no stakes to it because Plas isn’t really shown dodging the authorities over it. Plus, there’s the gangster and his girlfriend that’s turning into granite. She kills some other mobster at the end. The whole thing with her feels like an entirely unrelated thing, connected only marginally. I dunno. 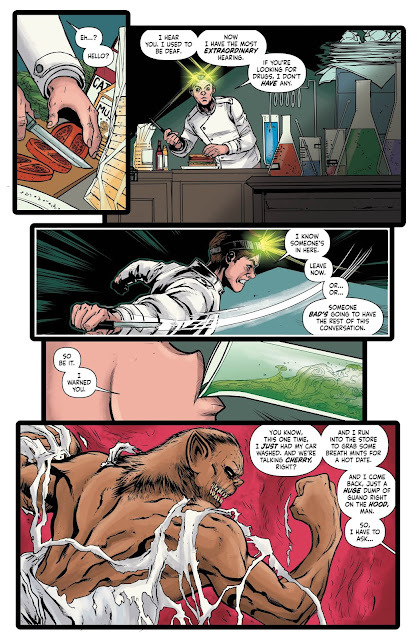 The art in this issue is back to what it was from numbers 1–3, so that’s nice. But I just can’t wrap my head around this miniseries. If only it were made of plastic. It's the penultimate issue of the series, and I'm still unclear about what are the stakes and where I'm supposed to be emotionally involved. It's going to take a masterful final issue to wrap this up neatly. If anyone can do it, it's this team.